Developing web applications for me is mostly programming Java code. But sometimes I need to create a image, or change a existing graphic. A couple of years ago I did some pixelart for PixelDam and I tried GIMP. 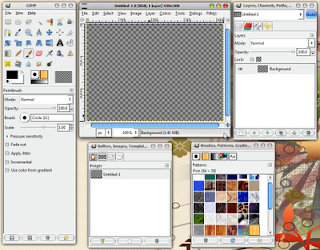 GIMP is a free image manipulation program with a lot of options and tools. And I was impressed with all the options available. With GIMP I can work on images and do almost anything I want or can (of which the latter is mostly the case, because I am not that creative when it comes to graphics).